I’m a meal planner, but I’ve tried and failed to be a meal prepper – taking a chunk of time on the weekend to chop veggies, cook a couple things, and set myself up for success during the week. (If you want to be inspired to do this, check out Shutterbean’s meal prep posts.) Mostly if I have a chunk of time on the weekend, I like to do something lazy and/or selfish. ;o) I’ve been loving having citrus kale salad components ready to go, though, and the idea of having some other healthy things available is super appealing. Usually when Jay grills he cooks some chicken thighs or breasts so we can use them later in the week. If we don’t grill, I miss the versatility that chicken gives me for more interesting lunches or a head start on dinner. 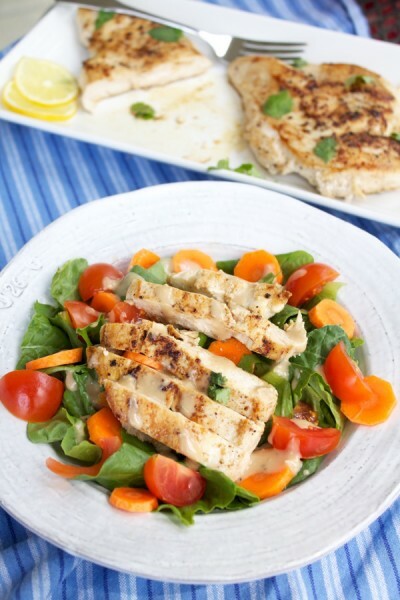 This quick and easy pan-seared chicken takes less than 15 minutes from fridge to plate, and while it’s not my beloved grilled chicken, it’s juicy, with a salty-seared exterior, and did I mention quick and easy?! …which makes it the perfect gateway meal prep recipe – and a faster than fast food meal in and of itself. The key to cooking a whole chicken breast in the pan is to pound it so it has a uniform thickness. I like to do this between two pieces of plastic wrap, and if you don’t have an actual meat pounder, you can use a pot. :o) I think my chicken ended up about 1/2″ thick, but you just want it to be even so the whole breast cooks at the same pace. Please enjoy getting your aggression out on this chicken. If your children are napping, please don’t pound chicken no matter how far away from the kitchen they’re sleeping. 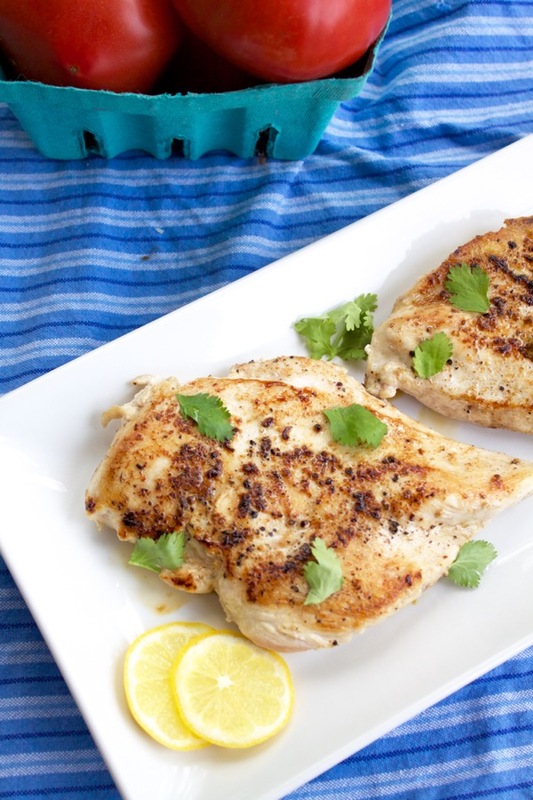 You can season the chicken however you want – this is just season salt and pepper. I’m planning to share some other versions of this chicken soon, but go crazy! Then it goes into a hot pan, and cooks for 3-4 minutes on each side. It gets nicely browned and since it’s the same thickness throughout, you don’t end up with the raw end and the overcooked end. I put slices of today’s pan-seared chicken on my salad, and I’m happy to have the rest of it in my fridge (especially since it’s all cute with my garnishes, something my leftovers don’t typically have). It’s great for sandwiches (and cheaper and healthier than lunchmeat), on pasta, on pizza, in burrito bowls or quesadillas. Meal prep yourself some! Start heating the oil in a large skillet over medium to medium-high heat. You want the pan to be nice and hot before putting the chicken in, but not so hot that the oil gets smoky. 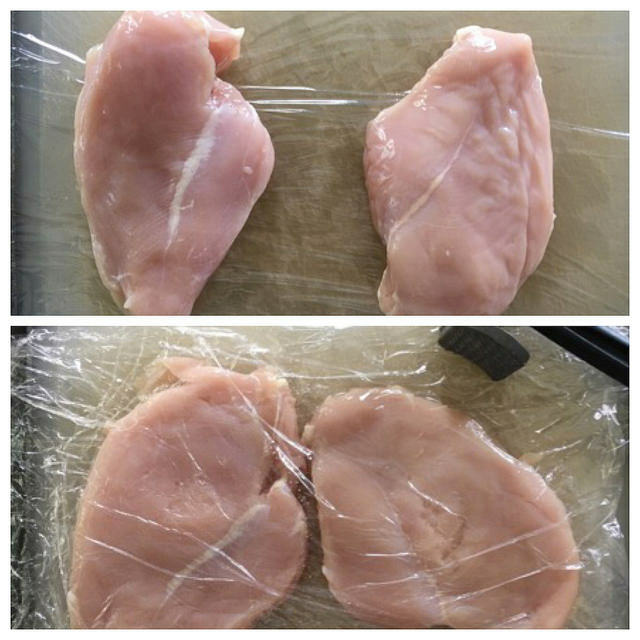 Place the chicken breasts on a cutting board or other hard, stable surface between two pieces of plastic wrap. Pound the chicken with a meat pounder (or a pot!) so that it’s uniformly thick. It can help to do a strike-and-drag move to get the middle to thin out without pulverizing the edges too much. Carefully place the chicken in the hot pan. Let it cook for 3-4 minutes, until it is browned on the first side. Turn the chicken over and cook for 3-4 minutes more, until it is cooked through. You want it to stay juicy, so keep in mind that the chicken will continue to cook a little after you take it out of the pan. Also, I like your new About pic. ???? Thanks!! It’s old, but not as old as the old one, soooo… ???????? Your new photo is GORGE! Also, the photos of this recipe are incredible! Great work, Bet! I love seeing you get more and more awesome with each post! You are so inspiring! You are sweet. Thanks for the encouragement, my friend!! Another idea for pounding meat if you don’t have one is the back of an ice cream scoop. Not my original idea, but something that I read on another blog that has worked! Thank you, Bet! Made this chicken twice this week, and it was inhaled by the boys! I’d forgotten about it and how easy it was! You’re the best ???? Ha! Like you need this recipe, lady. ;o) I hope it turned out well for you! 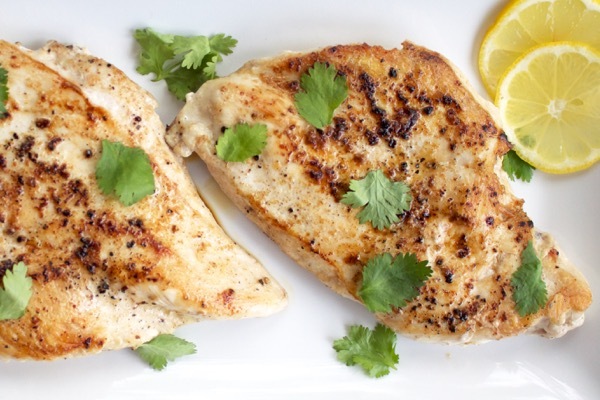 So flavorful and tender! The chicken breasts I had were about 10 oz. each, and those took a little longer to cook through (I also think I didn’t pound them as flat as I should have) — more like 12 min in all. I wish I could tell if they were done without cutting into them, but I haven’t mastered that skill!